NEW YORK (AP) Erislandy Lara and Brian Castano raised their arms, both believing they had won a close, competitive fight. Moments later, they found out neither did. Castano retained his 154-pound title Saturday night when he and former champion Lara fought to a split draw. Judge Kevin Morgan had it 115-113 for Castano and John McKaie had it 115-113 for Lara. Julie Lederman scored it 114-114 for the split draw, which drew plenty of boos from the crowd of 7,329 at Barclays Center. Lara (25-3-3) was trying to regain a title after the long-time champion had lost his belt by split decision to Jarrett Hurd last April in Las Vegas. Like that one, and many of his other fights, this one was too close to call in almost every round, with Castano (15-0-1) pressuring Lara around the ring and throwing more punches, but Lara coming back with precise left hands. "It was a great fight, but I saw myself winning eight rounds tonight," Lara said through an interpreter. "My punches were much more effective. He did have pressure but I was dominating the pressure." The Associated Press scored it 115-113 for Castano, the Argentine fighter who is 10 years younger but couldn't wear out the 39-year-old Cuban. "Again, I demonstrated I'm not old," Lara said. "I'm still fine-tuned." Fellow Cuban Luis Ortiz did win his bout, taking a lopsided unanimous decision over Christian Hammer in a 10-round heavyweight match. Castano kept his hands held high and was able to block many of Lara's left hands early in the fight, but the veteran began getting them through the guard more often as the fight went on. Lara's loss to Hurd was a thriller - awarded fight of the year for 2018 - but he looked old at the end of it, getting knocked down in the final round to ultimately cost him the fight. But he held on until the end in this one, though Castano won the final three rounds on all three scorecards. The champion was frustrated afterward, believing his aggressiveness should have won him the fight. He outlanded Lara and was credited with throwing 668 power punches to Lara's 301, but only landed 78 more of them against Lara's crafty defense. "It was a good fight. A clash of styles. I know I won the fight," Castano said through an interpreter. "I feel I was robbed. If he wants the rematch, I'll give him the rematch." Ortiz (31-1, 26 KOs) won his third straight since his lone loss, when he was knocked out by WBC champion Deontay Wilder in the 10th round of their title fight in this same arena last March. 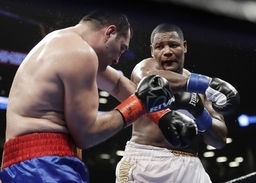 This was the first of those victories that wasn't a knockout, but the 39-year-old Ortiz wasn't disappointed and still wants a rematch with Wilder or a fight with Anthony Joshua, who holds the other heavyweight titles. "Every heavyweight out there should know that I still have it at 40," Ortiz said through an interpreter. "Anthony Joshua, Deontay Wilder, I'm ready." Ortiz won every round on one card and all but one on the other two. Ortiz bloodied Hammer's nose in the fourth round, but Hammer answered back with a good right in the fifth that bloodied the face of Ortiz, whose white trunks appeared pink in spots by the end. Hammer (24-6), a Romanian now living in Germany, seemed to enjoy his chance to perform in New York, gesturing to the crowd during the fight and posing for pictures in the ring afterward while Ortiz was conducting his post-fight interview with his daughter by his side. "Ortiz is a very good and experienced fighter. He's technical and smart but he's not as intimidating as people say he is. I respect Ortiz but I don't think he's the best fighter I've ever faced," said Hammer, who has faced Tyson Fury.